Tribeway Helps People Not Just Share Pictures and Videos, It helps them Share Time! Ittiam systems is a global technology company and a leading provider of digital media solutions and caters to the unique requirements of the online video segment. Ittiam specializes in multimedia solutions for a seamless video distribution and delivery, ranging from content creation to consumption. Ittiam envisions to deliver state-of-art, smart, comprehensive online video solutions which would ultimately help customers build great products. With more than a dozen social media platforms cropping up in the digital space, it gets tough to garner the attention of the audience to one particular platform. Social media applications suffer rise and fall of consumer interest. What keeps an app competitive is the ability of a platform to innovate and bring value to the users. The platforms that fail to impact users’ lives gets petered out. Ittiam wanted a social media application that could bring back the moments of shared laughter, joy, and togetherness for users. With tons of visuals to share and talk about, communication has come a long way from simple text messages. Ittiam envisioned to deliver a high touch interactive conversation within a personal network for users as if they were all in the same place at same time. Enable easy collaboration: The solution needed to bring together the best of social networking and messaging and take it to the next level of real time interaction. The solution needed to provide right features to help users interact and collaborate in a hassle free manner. The application should be dynamic enough to serve the purpose of everyday interaction between friends or help business users to provide remote support and consultation for businesses. Ensure high availability and accessibility with security: Customer wanted the application to facilitate real-time conversations over pictures, posts, and YouTube. Hence the application needed to be secure, and highly available and accessible with communication, coordination, and social functions closely integrated. It’s great to ‘chat’, but awesome to ‘Talk’! Ittiam chose to work with MediaAgility to build critical functionalities on the cloud for Tribeway, an app that met their two point requirement. As a system of engagement based on Google Cloud Platform, users can quickly collaborate with their personal connections – collectively called a tribe – in pursuit of sharing their moments of joy and togetherness when they are miles apart. At the heart of the application is the interaction within a personal circle. 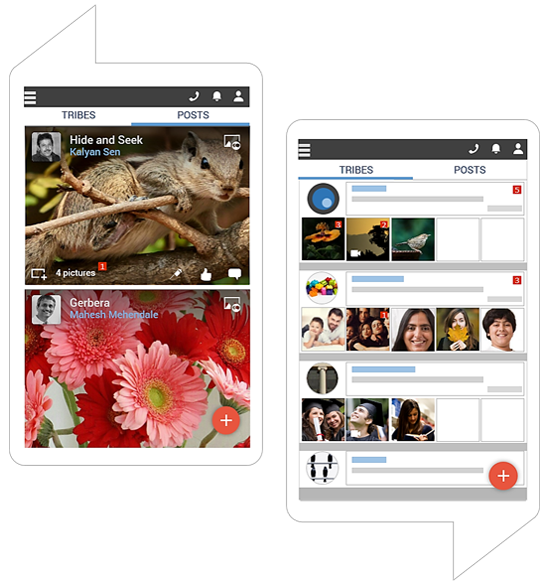 It is designed to bring together the best of social networking and messaging. It is all about active interactions with pictures and videos and not just passive file sharing. For example, a tribe can connect over a picture or video and everything that is talked about the captured moment is recorded as a crisp conversation. So users feel no need to spend time searching for all the comments made about a picture. They are all neatly stored as conversations. Not just pictures, users can create posts and share an entire story as they message. Have a real-time discussion around the pictures as they talk on the HD voice call with one or more people. Share their story – share pictures and even posts with multiple pictures. Point, zoom, and pan the pictures as they discuss it. Collate all the messages around a picture as a conversation which can be viewed in one shot. Alert friends – So that they do not miss out on a conversation, a video, or a picture. High availability and accessibility with security: The content based application for communication, networking, and live interaction has been helping users run smooth conversations with over 10 people in a tribe. The Google Cloud Platform powered solution enables users to easily share content such as text messages, pictures, and videos. The content remains personal to the users and remains on Google Drive or their own phone. At the heart of the application is the human nature that strives to connect and engage while being miles away. The solution is impacting the lives of more than 130 thousand users on Android, Apple App Store, and Google Play. “The idea to enable real-time interaction with an underlying social networking framework, which was highly reliable and scalable was challenging, yet exciting! We successfully achieved that with Google Cloud Platform. Ittiam provided a clear roadmap for Tribeway and we were determined to deliver it with the app running on latest digital technologies.” – Kamal Puri, Director, Digital Innovation, MediaAgility. June 13, 2016 MediaAgility Inc.